So I spent about six hours cutting into the precious and have enough strips to make 25 scrappy tripalong blocks. 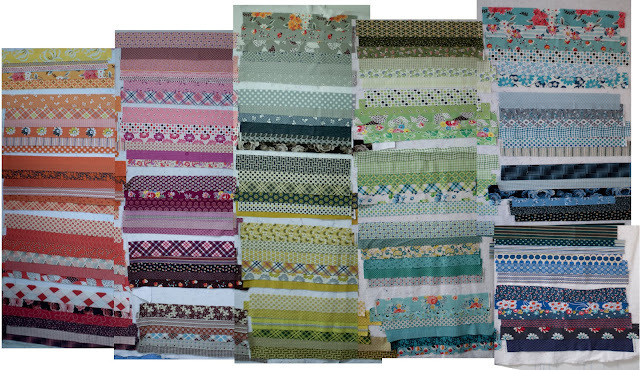 That means I have 150 different DS fabrics. Ahem. Here is a fairly dreadful and cobbled together photo of all of them on my design wall. And now I need your help because I am not sure what approach to take with the piecing. My inner obsessive says “keep it rainbowy, stupid” but I am truly, DEEPLY concerned that this will just not work and I should go for a much more random approach. Bear in mind that I don’t have more of quite a few of these fabrics, so definitely do not want to stuff this up. Although on the plus side, they do look quite nice just up on the wall like that, so maybe I’ll just forego the piecing altogether and leave it as it is. Your opinions please!